Our internship program sustains Caktus’ growth, challenges and reinvigorates our development practices, builds our relations with the local tech and wider Django communities, and hones our operational practices as a company. This post shares our guiding principles for how we structure our developer internship to achieve these goals, while providing a meaningful and edifying experience for the interns we hire. It is costly and disruptive to hire the wrong person; we want to get it right. Our internship partially functions as a pipeline for identifying local talent. We have to look at each and every candidate as though he or she could be joining our team full time. Having a paid internship is one way to open the gates of the tech industry to those who have traditionally been shut out. It makes tech jobs more accessible to a wider pool of diverse talent. We want to get this opportunity in front of as many people as possible. Our internship is unique in that it is fairly flexible and self-driven. It takes a candidate with a sufficient level of independence and moxie—balanced by the humility to ask for help when needed—to make this structure work. Finding such a candidate requires a significant amount of effort. Central to the success of our internship program is a deceptively simple tenet: treat each and every intern like an employee. It seems obvious, but many companies do not do this. For us, it is the most important element to an internship. Not only does it create an atmosphere for growth, but it also accomplishes the actual goal of an internship: introducing a novice to the real experience of working as a part of a development team. Rather than siloing our interns onto separate teams and assigning them busy work or the task of creating tools that will never be used again, Caktus interns are placed on a real team with our full-time developers. They are wholly integrated team members, taking part in all Scrum activities and any other team-related meetings. Like any other developer on their team, interns self-select their work during sprint planning. They participate on real projects that will continue to be used and added to. They are doing work others will need to use later, learning best practices for writing clean, scalable code. At heart this means that our internship is not an academic experience, it is a practical one. We have found that this practicality serves as the best atmosphere in which an intern can grow. And what do we get from instilling such trust in our interns and bringing them on as full-time team members? Having an intern fully participate on a development team encourages a more collaborative culture of mentorship in which questions are welcome and everyone remains open to fresh perspectives. An internship is a great way to practice, solicit feedback on, and fine-tune operational processes. Our internship program has been a great way for us to improve our interviews as well as our candidate screening and hiring practices. From onboarding to exit interview, we take our intern through the full process like any other employee. Not only does this give the intern necessary career experience, but it also creates a helpful feedback loop for internal process improvement. Of course, treating an intern like an employee requires a lot of trust as well as the proper environment for success. Our interns themselves need to be sufficiently driven and sufficiently humble, and the structure of our program needs to support this balance. We have found the most success in allowing a self-determined and malleable learning plan, while providing the mentorship necessary to lend structure and direction. To achieve this delicate balance, guidance through mentorship is key. Every intern is assigned a mentor from day one of their internship. Interns and mentors meet regularly to set, discuss, and track progress on goals, give and receive feedback, and evaluate personal and professional growth. We hire interns with a variety of goals: from students still in school exploring web development as a potential career, to young adults fresh out of school seeking to enter the technology sector, to individuals seeking a career change after having worked in other industries. Whatever the context, we make sure to cater our mentorship program to each intern’s self-identified goals. Instilling development best practices: mentoring developers who will go on to write code the right way. Imparting Caktus’ values: producing developers who will be curious, empathetic, seek excellence, and give back to their community, whether that be through open source contributions or future mentorship. 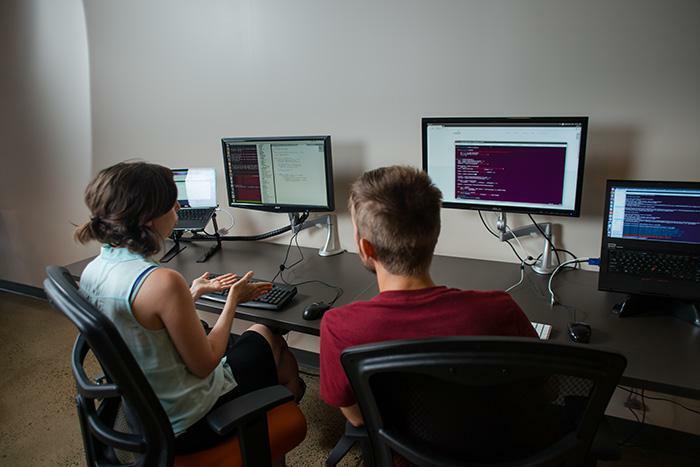 Ultimately, we love helping to mentor and grow developers in the community, and our internship program is a key part of that effort. Learn more about our program and what it’s like to be an intern at Caktus from a former intern’s perspective. Congrats to PearlHacks Winners (Including Our Intern, Annie)!